After our Wonderland 2011 hike we toyed with the idea of submitting an application again this year to experience the trail as most people do, i.e. when you can actually see the trail rather than just snow. We figured we would get a rejection letter but amazingly our application was drawn on the first or second day of processing and we got the exact itinerary we asked for. Taking that as a sign that we should do the trail again, we started training and planning. A big advantage of doing this in back to back years was that planning was a breeze. We made only minor changes to our gear list – no blue foam pads as we did not expect to be snow camping and a few other tweaks. 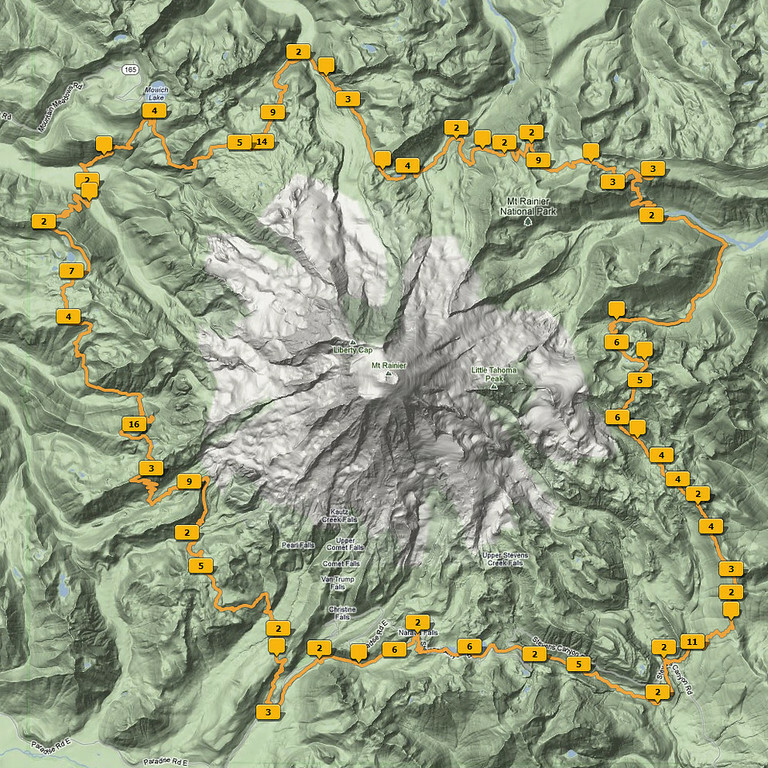 To make this a different experience from last year we went counterclockwise, stayed at all the high camps that were buried under snow last year, and took the alternative route through Spray Park. Almost everyone does the trail clockwise (counterclockwise is considered the harder direction) and Spray Park adds some more elevation change so we figured that would keep it from being too easy. Ditto on food, pretty much same as last year, although we did pack a bit more of it. My goal was to minimize the weight loss to a few pounds, which I succeeded at. Gina went with a lot more protein bars (vs granola bars) and said she had more energy during the day as a result. Having a new appreciation for how great jerky, chocolate bars, and M&Ms are after a week on the trail, we packed a lot more of those. Also tried a new approach with Mountain House meals of taking the contents out of the foil packs and storing them in zip-locs to minimize the volume. We took one foil pack with us for each person and put the zip-loc inside while it was heating. This worked great and saved a lot of food stuff sack space. I could not handle all the great scenery with the simple point and shoot I used last year so I splurged on a Nikon P7100. This was a last minute decision and I did not have time to condition the batteries to get maximum life out of them. I was figuring 400 shots per battery by keeping the LCD off and not using flash. I took 3 batteries and wound up getting about 250 shots per battery so after burning through the first one in two days I went into picture rationing mode (just like last year). Meanwhile Ryan used the Canon SD1300 from last year and got about 2 times the shots per battery that I did last year, probably because they were new batteries in that camera a year ago! He barely used 1.5 of the 3 batteries he took. Aside from the battery life, I was very happy with the P7100. Really good image quality shooting in RAW for a compact camera that weighs less than just the DSLR lens I would have brought for my good camera. I do wish it could go a bit wider (28-200mm equivalent focal length) but there aren’t many options in this class of camera. Our training this year was pretty limited with the ridiculous heat we’ve had. It mainly consisted of going up and down a 100 foot hill near our house… many many many times. We also did the northern loop of the Shawnee backpack trail. This actually worked well – just enough conditioning to avoid any soreness or issues on the actual trail. The snow situation had us a bit worried until early July when it finally warmed up and melted things out (mostly) by the time we started. The higher elevations still had some sizeable snow fields but absolutely nothing like last year. I am honestly amazed we were able to do it last year after seeing it again this year without the snow. All I can say is that we were really determined last year! “Comfortably familiar but a unique experience” is how I would summarize the trip. Some 2011/2012 side by side comparison shots from last year shows how different many parts were due to the snow. Knowing the snow would be much less than last year, we had total confidence we would be able to complete it. Going the opposite direction worked out well. I was afraid we would be passing hordes of hikers going the other way but we actually saw very few people except near the car accessible points. A neat benefit is that we met several groups of people at various points then met them again about a week later as we passed again on the opposite side of the mountain. Hard to say if going the opposite direction was harder this year because in general everything was so much easier since we were on an actual trail rather than snow. Navigation was certainly a lot easier! Unlike last year, we did manage to see 2 bears, one right by our campsite and one just off the trail. Saw a third one high on a hillside and barely visible so I don’t really count that one. This will probably be our last Wonderland for quite awhile but I am hopeful we will have the chance to do this again with the kids in 10 years or so and relive some of these wonderful memories! Thanks again to Ryan and Kyle for being willing to do another vacation with us – you guys are the best kids we could ask for! Locations the gallery photos were taken from (numbers indicate how many from that location if too close together to be shown individually at this zoom level). Red is our 2011 GPS track log, Blue is from 2012. Overall we stayed on the trail last year pretty well considering how much of it was under snow. When zoomed in you can see lots of deviations and minor off trail diversions last year while working through the snow. *** “Hell Day” was on the Southwest side and a large deviation is visible. On the Northwest side we took the Spray Park alternative “high route” this year. At Sunrise we took a different route last year since we were not staying at that camp. Anatomy of Hell Day 2011 where we lost the trail in snow and then had to bushwhack up about 700 very steep feet to cross over a ridge. 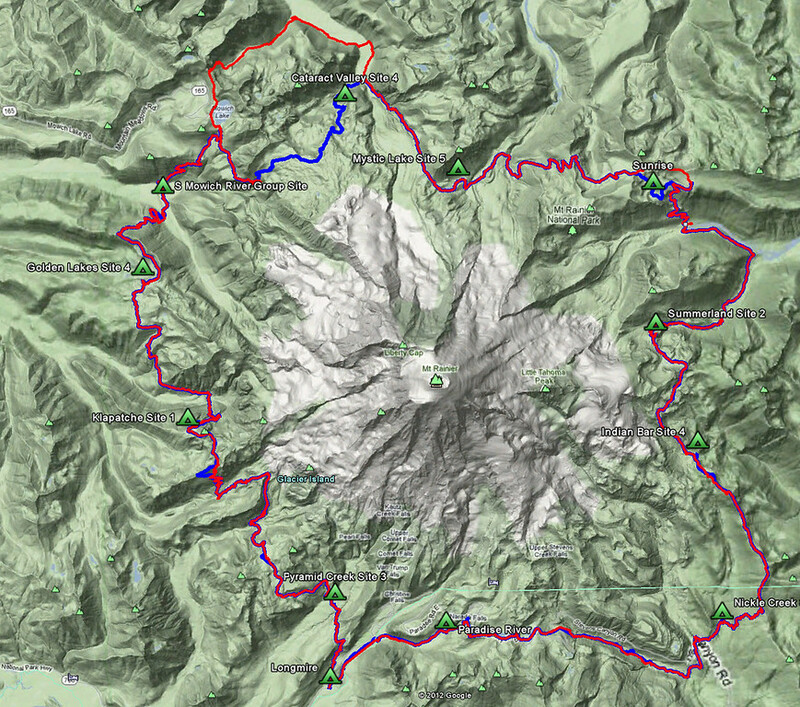 Red is our 2011 route and blue is the actual path. 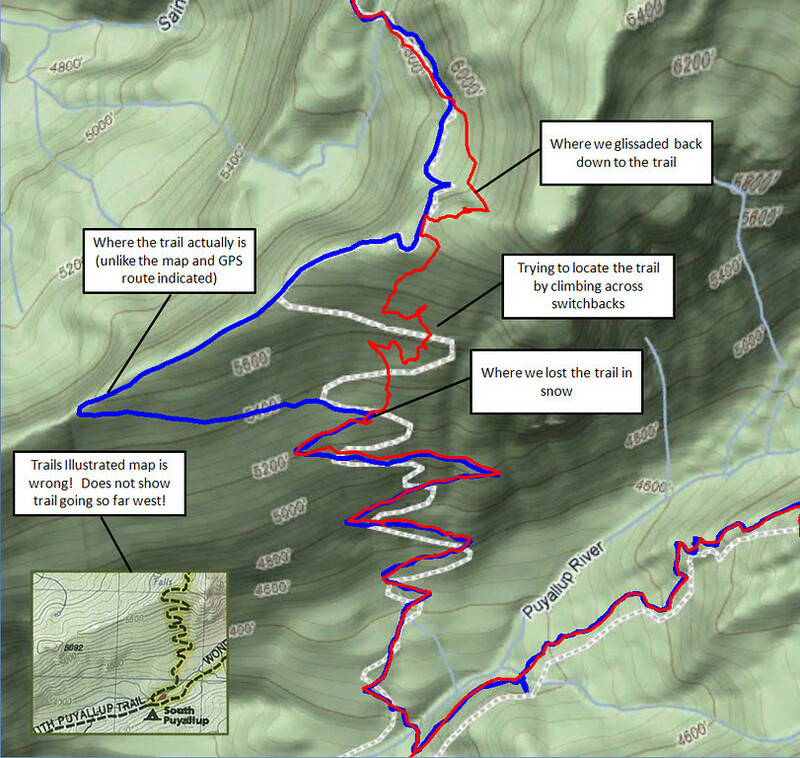 Note the GPS route (dashed grey) and Trails Illustrated map route (inset) are both out of date with respect to the actual trail (blue). Unfortunately this was a bad place for the map to lead us astray last year. At least I now know why we could not relocate the trail by crossing switchbacks. 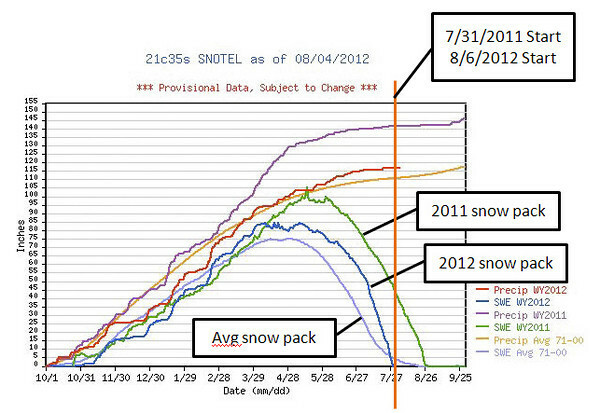 Graph showing the snow melt. The units are in inches of water that the snow pack is equivalent to – short version, about 5-8 feet more snow last year.